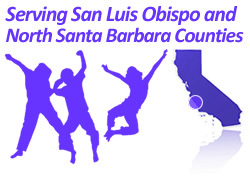 Premier Inflatables provides service to areas as far north as Paso Robles, and travels as far south as Buellton. If you have a question about whether we service your area, please contact us. Call us at (805) 478-2819 and we will reserve a unit for you, and gladly answer any questions you might have. 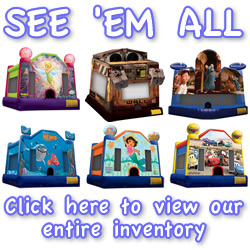 Why should I rent a bounce house from Premier Inflatables? Our bounce houses plug into a standard 110 household outlet. We will supply the cord, and we request that nothing else be plugged into the outlet being used. Placement of the bounce house should be no more than 50ft from that outlet. If you would like to set up a bounce house at a location that does not have an electrical outlet we will be happy to provide a generator for an additional charge. Generators are to be used for the sole purpose of operating the bounce house and nothing else should be connected as this can adversely affect the operation of the unit. Can I rent a bounce house if I am having the party at a park? Yes, Premier Inflatables is licensed and insured and is approved by local county and city parks. Premier Inflatables only accepts cash payments. What types of surfaces can the units be placed on? The safest and optimal surface is a level grassy area; however, we can also set up on a level concrete or asphalt area. Please indicate which surface we will be setting up on when making a reservation and we will be sure to use the appropriate anchors for your event. Only participants of compatible ages and sizes shall play in the unit at the same time. Please call us at least 24 hrs. in advance and there will be no cancellation fee. How much room is do I need for the bounce house? As a general rule we add 2′ to the width of the unit and 4’½” to the length of the unit to accommodate for the entrance ramp and the blower, and a vertical clearance of 15′-22′ is needed. However, we will inform you at the time of reservation the required space for the particular unit you are renting. Are your units compliant with Proposition 65? YES, our units are “lead-free”. Lead free means 90 ppm (parts per million). CPSIA and Cal. Prop. 65 compliance limits are 300 ppm.